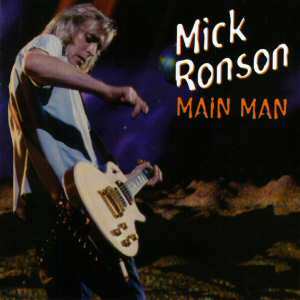 Mick Ronson CD: "Main Man"
Hard on the heels of Snapper's release of Mick's first two solo albums comes this 2-CD set, which is effectively a "best of" compilation of those two individual CDs. This is not a simple repackagaing of two individual CDs as a "best of" set. The running order is different, and seems to work well. Some of the "bonus" tracks from the individual CDs are included here, while others have been left off. Sound quality is excellent; packaging less so. There are sleeve notes, of course, with the usual (short) biog about Mick, which didn't impress me at all. All the tracks on this CD have previously been issued. They even manage to include Pain In The City twice - why I don't know. For completists only.